With the move to iOS 11, we’ve seen flashy releases centered around augmented reality, drag and drop, and depth mapping, showcasing what the headlining features of the new OS look like in practice. But an under-the-radar feature, QR code support in the Camera app, is shaping up to have a promising future, and Visual Codes shows us why. 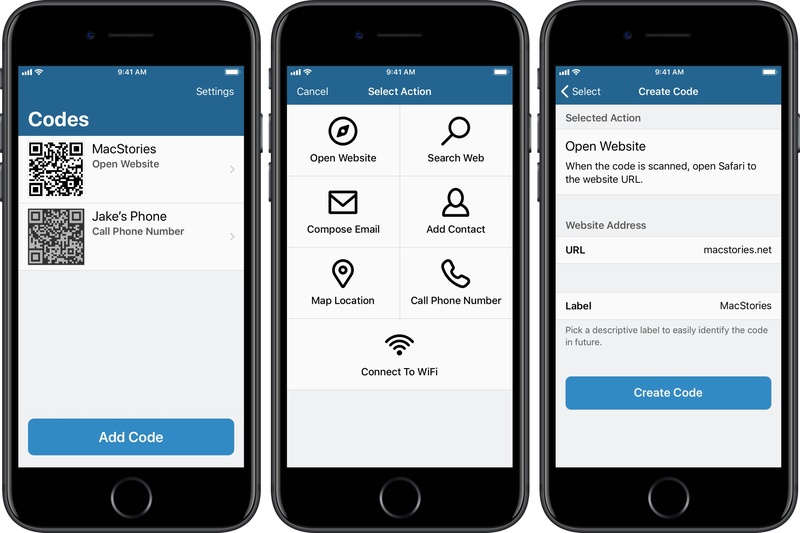 Created by Benjamin Mayo, Visual Codes generates QR codes for digital actions – like adding a contact, connecting to Wi-Fi, or calling a number – and allows you to use them in the real world. Basically, all you need to do is add the relevant information to the app, label your code, connect to a printer, and you have a physical shortcut in your hands. Apple saw promise of tools like this when Craig Federighi showcased the feature on stage at WWDC; QR codes, Federighi said, could make connecting to Wi-Fi as simple as pulling out your phone’s camera and pointing at a QR code on your router. Now, we see that that and more can be feasibly done in iOS 11, and I can’t imagine a better app for it than Visual Codes. Not only does the app create your codes quickly, but it also makes it a breeze to organize and share them for when you need them the most. With the ability to change the code’s colors, users can have more control over how they look in a home, on a sticker, or on a computer screen. And when you’re ready to print, you’ll get the option to print one or many codes on a single sheet of paper. Whether you’re looking to speed up common tasks or help others get more information, Visual Codes and the Camera app is a winning combination. When all of my friends update to iOS 11, they can start using the QR codes I plan to put up around my house.